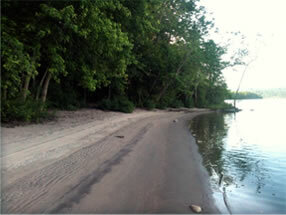 For more information on this state park, Click Here. Easily accessible from Rt. 154, Haddam Meadows offers a wide open space and a beautiful stretch right on the Connecticut River. Facilities include a boat launch and picnic tables. Simply turn off of Rt. 154 at the State Park entrance sign, and park in the lot at your left, or drive down the paved roadway to your right to access additional parking. For driving directions to the park entrance, click here. Bordering on the Connecticut River, Haddam Meadows offers beautiful water views. Our Downloadable Trail Map for Haddam Meadows indicates a paved route (gray) and earthen trails (green). About half of the park is an open meadow (hence the name) and the other half is forested. When walking through the meadow section, you can walk the perimeter of the meadow, including the Connecticut River waterfront, but you can also walk, run, play, picnic and more in the meadow. It is a popular spot for dog walking, frisbee throwing and golf practice among other activities. In winter, it is a favorite spot for X-Country skiing. Occasionally events such as antique car shows are hosted here. Note on the map that a railroad line is indicated. This stretch of rail is currently not used for trains, and is another popular area for walking and X-Country skiing. If walking on the railbed, be aware that the old railroad tiles and rails can be a tripping hazard, and overpasses can be particularly unsafe. 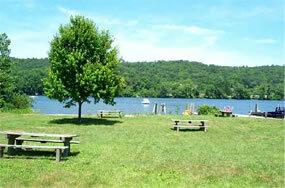 Haddam Meadows has a wide open space for a variety of activities.